The idea of a national flag for India was used at various junctures of the Indian independence movement. The early iterations of the flag used colours and symbols to signal India's religious diversity and pluralism. (See Madam Cama's version - the colours green, saffron and red indicate Muslims, Hindus, Sikhs and Buddhist; the lotuses portray 8 British provinces, sun and crescent represent Hindu and Muslim identities) Towards the late 1920s Gandhi wanted an Indian flag that had a non-religious character and reflected universal ideals. The flag designed by Pingalli Venkayya, upon Gandhi's suggestion, was adopted by the Indian National Congress in 1931; red stood for sacrifice, white for purity, green for hope, spinning wheel for economic liberation. On 22nd July 1947, a few days before India’s Independence, Jawaharlal Nehru passed a resolution in the Constituent Assembly to adopt the tricolour flag with Askoka Chakra in its centre. Nehru noted that the colours have no religious significance and the substitution of chakra instead of charkha was an aesthetic and design need. 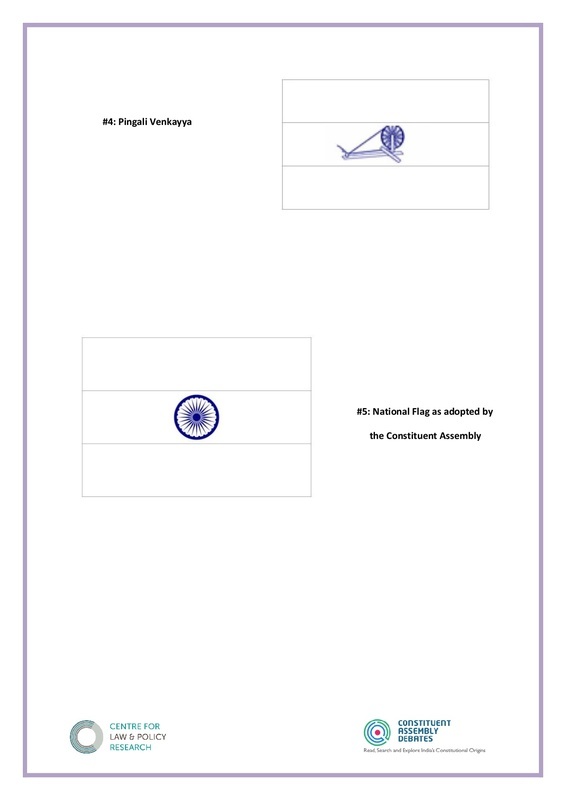 (the flag with spinning wheel in its centre cannot be symmetrically printed) However Srirupa Roy argues that the removal of charkha - symbol of Gandhian philosophy - signalled 'wider reorientation of political and economic philosophy under way at the time, as Gandhi's vision of a decentralized, economically self-sufficient India of village republics was replaced with Nehruvian commitment to an industrialized and centralized polity.' Nerhu's resolution was accepted unopposed and drew praises and allegiances from Assembly Members coming from diverse identities.